Oh, Van Halen. 10 successful studio albums with two different singers ranging from era-defining classics to discs of “meh, it still has some great ones in there” go by and things are still hunky dory. A definitely impressive streak of consistency atop the world rolls along…and then again, the frontman gots to go. Apparently not even pushing out a few new tunes (nifty ones at that) for the soundtrack of Twister was enough to prevent Sammy Hagar’s departure from the band in 1996. Then again, one must remember that that was also the first time since David Lee Roth’s departure in ´84 that news of the Diamond One’s return to his rightful place were super-duper serious (something that definitely influenced Hagar hitting the exit). I mean hell, they made the big united appearance announcement at some MTV award show and recorded two new tracks for the Best Of Vol. I-compilation that came out in ’96 (and let me add that those two tracks are flappin’ brilliant, seriously). The original foursome was supposed to hit the studio again and tour worldwide and…flame out. Whether it was egos or managerial clusterfucks or who knows, the big aforementioned hype led nowhere. Jump forward two years and things had gotten interesting/weird. Van Halen now had their third official singer, Gary Cherone of the then-disbanded Extreme and a new album was on the way. Lemme get this out: I love Extreme. Their brand of funkified and occasionally grandiose, semi-proggy hard rock (it’s clear dudes were crazy about Queen) is brilliant and Pornograffiti is honestly my favourite rock album of the 1990s. Nuno Bettencourt is so underrated as a guitarist, songwriter and even singer that it is not funny and heck, Cherone fit in there nicely with his hoarse croon and quirky half-spoken stylings. 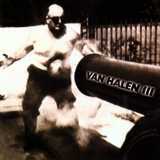 Along with his voice many of those elements have seemingly bled onto Van Halen III and it…it just doesn’t work. Not to make too big of a number of Gary’s role here (also, take note that this disc is also often labeled an EVH-solo album), it’s evident that the Van Halen brothers wanted to expand their party rocking sound as well. The goal is certainly admirable and one would think these beasts of their instruments and songcraft would have the know-how to pull it off but…just no. The overall feel of the record screams that they’re aiming at artsier and “deeper” material with layers of tracks and little elements, be they effected loops or small guitar screeches or whathaveya, crammed in there. Some songs cross into seven-n-a-half, eight-n-a-half minute territory and as nutty as I am for prog rock, this album just fails at filling that time. The somber Once sounds like an attempt at Innuendo-era Queen or some rocked-up version of 1980s Genesis and it just falls horribly flat. Lengthy mid-tempo burners like Year To The Day show the maestro Eddie throwing around a madhouse of arpeggios and riffs and moods but nothing sticks. That’s an unprecedented feature here too. Eddie Van Halen’s riffs are not working. Sure his solos buzz around nicely and are filled with technical flash but it feels so cold that one should be shocked. Doesn’t help that the overall guitar tones, usually such a savior, are a bit flaccid as well. Alex and Michael Anthony don’t fare much better as the rhythm section as their kicking goes through the motions something brutal. Without You tries out the aforementioned extra-funky groove but simply comes off seriously lazy. And GOD enough with those cluttered effects crammed atop so many bits of vocals here and there. Awful! Dirty Water Dog feels like a poor, poor rehash of the slightly countrified twang of Finish What Ya Started but doesn’t go anywhere. Ballot Or The Bullet exemplifies the slightly quicker rocker that is the band’s ultimate trademark. I admit that it even contains effort but seriously, is this Van Halen-level whipping? No. There is actually a single song here that does reach that level in my books. Fire In The Hole starts off with a really weird pumping beat and what sound like simulated cannon shots until Eddie blasts forth the one blatantly awesome guitar riff on the entire album. I LOVE the opening riff to this tune. Finally, that groove works. The chorus does leave a bit to be desired in fire, but hey, it’s still catchy. Sizzling solo! I can remember this! It may very well be that I’m loving this track simply because it’s such a spark of joy among so much mediocre blandness but to hell with it, what a killer!! The album closing How Many Say I seems to encapsulate the overall mood here pretty well. A completely piano-driven ballad, it’s an oddball first in that Eddie provides the lead vocals. He doesn’t do a bad job but good sir, Gary’s right there on background vox so maybe he should take over? Otherwise the encapsulation continues with the flourishes of strings bringing atmosphere and trying to be somewhat epic and emotional but…like so much on this album, it’s a commendable attempt but just doesn’t work. Fhew. Everyone who has delved into commentary about Van Halen’s discography, has probably noticed that this album is “the forgotten one”. Where for example Priest has Jugulator and Demolition, Van Halen has III – albums that have been largely forgotten by an otherwise major band, be it in terms of tunes played live or subsequent releases (No tracks off of this record made VH’s 2004 Greatest Hits-compilation The Best of Both Worlds and trust me, none of them have been tackled on stage after Cherone’s departure from the group). It might be cool to at least try and be among those writers who defend big releases panned by a large majority and proclaim what a shame it is that this record gets shafted, but just no. Even a fan of my massive boydom cannot go there. This is by far, by FAR the worst Van Halen album out there. I can only recommend it for completist collectors (such as myself *sigh*) or the anthropological types who find interest in different phases of entities, such as bands in this case. If one simply wants to hear good Gary Cherone-lead VH-material, just check out Fire In The Hole on Youtube or the like and save yourself the time. To make things clear, no, taken at face value this record isn’t disgustingly bad or anything like that. Almost everything in it is just bland, boring and mediocre and when such characterizations get linked to the hallowed name of Van ghaadaaaaamn Halen, you might as well be disgusted anyhow.